In a pestle and mortar or cocktail shaker place your mint, rum, sugar, lime zest and lime juice. If you have time do this in quantity before hand to allow all the ingredients to macerate lightly. With your pestle or a nicely round blunt object smash and bruise the mint until your whole mix has turned green. Place equal quantities in 4 glasses. Top with crushed ice and fill with soda water. 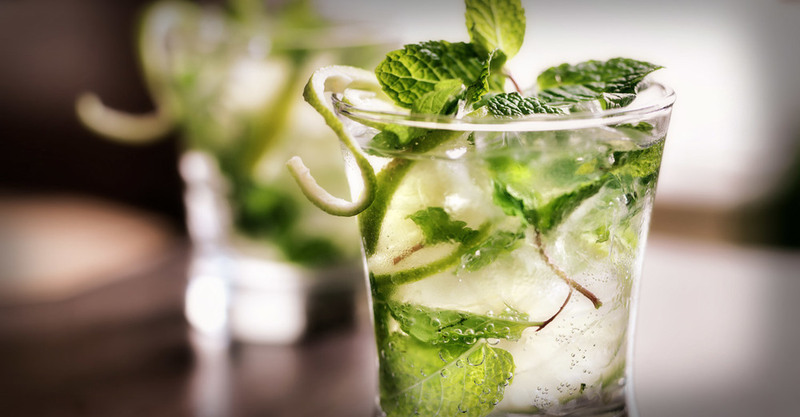 With a long spoon or knife vigorously mix the mint base until incorporated with the soda water. The trick is to have it well incorporated with the soda but the ice still providing a barrier between the mint and the rim of your glass. No one wants to be walking around with mint in their teeth.